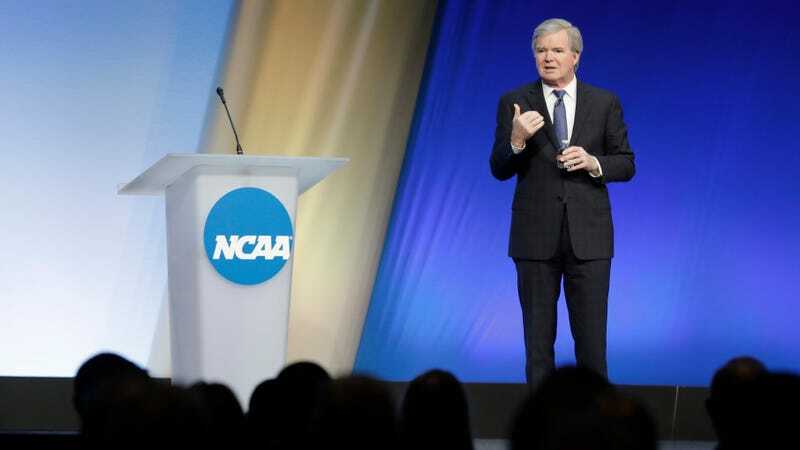 While speaking with reporters at an NCAA conference in Indianapolis last Thursday, NCAA president Mark Emmert was asked to comment on Michigan State’s role in abetting Larry Nassar’s years of sexual abuse while he worked as a team doctor for the university’s women’s gymnastics and rowing teams. His response was both utterly useless and completely predictable. If it feels stupid and silly for the president of the NCAA to stand there and say he doesn’t have “enough information,” despite the fact that Michigan State’s sins are widely known—they did not reach out to the victims for six months; they ignored reports of Nassar’s assaults for years; they allowed Nassar to continue seeing patients alone while under investigation; they billed the family of 15-year-old gymnast for her visit while Nassar sat in a jumpsuit listening to victim testimony—that’s because it is. Hell, the majority of the initial reporting, including an interview with Rachael Denhollander, was completed by the Indianapolis Star, the hometown newspaper for Emmert and NCAA headquarters. But looking stupid and toothless is all the NCAA can do when a scandal like this occurs, because that’s all a self-evidently useless watchdog can do when confronted with real injustice. The governing body of the near-350 Division I member schools is constituted of commissions and employees that take their direction from the leaders of the very same member schools. The NCAA was not created, nor does it have the jurisdiction, to keep the universities and colleges in line on sexual assault or any like area of concern. The NCAA’s sole purpose during its formative years was to legitimatize the stream of cash they make off the back of unpaid college athletes. It’s there to act as the knuckle-cracking disciplinarian in name only, without ever dipping its toes into subject matter that actually needs the attention of a ruling body. Limited by rules crafted and voted on by the universities themselves, the NCAA instead spends its days cracking down on football kickers with YouTube pages, carrying out the vendettas of middle-aged men at the expense of college athletes, and making sure class-attending athletes serve their time on the bench. To imagine the NCAA doing anything useful in times of crisis would be to imagine the NCAA as the antithesis of what it actually is. As shown in its failed attempt to sanction Penn State and the subsequent penalty reductions, when challenged in a court of law, the NCAA falls flat. Its member schools have not deemed the institution fit to police them on serious matters, and the ramifications of the Penn State case ensured the NCAA would tuck-tail in all future sexual assault cases. This isn’t to say that the NCAA should be striding forward to get tough on Michigan State and start doling out punishments—the organization is in no way qualified to be a moral arbiter here, just as it wasn’t during the Penn State case—but to provide a stark reminder of just how truly useless it is. It was only ever designed to deal with issues that don’t matter; confrontations with real problems will always leave Emmert with nothing to say, and the NCAA with nothing to do.